You finally brought home your new VR headset, and you rushed to your computer (or PS4) like a kid on Christmas morning to set it up. Naturally, you jumped into a game and started playing. But 10-30 minutes into your first VR session, it was already too late; motion sickness had arrived to ruin your fun! Motion sickness is a common thing for people who aren’t accustomed to mixed signals acting on their inner ear while receiving information from multiple sources of motion. Simply put: If you’re experiencing motion sickness, it’s because your inner ear can’t tell whether you’re moving or not moving. When you enter VR, your eye perceives the virtual world as being a physical space—this is because of how closely your head motion correlates to what’s in the display. It’s also why your brain gets mixed signals when your eye detects motion while your inner ear doesn’t detect any motion at all. And that mixture of contradicting signals is too much for your brain to digest at once—resulting in severe nausea and other unpleasant symptoms. Which, of course, is why you’re here in the first place. Unless you’re a sailor or a professional backseat driver, it’s totally understandable to come down with bouts of motion sickness when you first enter VR. Luckily, there are some things you can do to alleviate the symptoms of motion sickness or even delay it from occurring in the first place. Keep reading to get some juicy tips. Running or walking in place is a way to tell your inner ear that you’re moving the same way that the rest of your virtual “body” is moving. It’s a simple gesture that also helps you burn loads of calories while you play. And it makes artificial movement in games such as Rec Royale feel more natural. Be warned though: This trick works best when you’re simulating smooth motion in an open gameplay space. Again, the prime example here would be games like Skyrim VR, OrbusVR, Rec Room, Pavlov VR, etc. I always plug Natural Locomotion for SteamVR whenever possible. It’s a piece of software that lets you activate artificial motion in VR games by pumping your arms; a tactic for fighting motion sickness that goes well with running in place. It absolutely deserves a shout-out here. If you run or walk in place while your avatar is standing still, you’ll obviously get more exercise—but it may not alleviate any motion sickness you’re experiencing. If you’re dealing with motion sickness in a stationary game, you’re probably dealing with game performance issues. Read below for more info. VR has plenty of excellent games that are built around small areas embodied by the exact size of your playspace. SUPERHOT, BOXVR, Beat Saber and The Thrill of the Fight are perfect examples of stationary games that generally won’t induce motion sickness (because there’s no artificial motion to speak of). But stationary games also have one major thing in common: a fixed point of reference. Additionally, many free-movement games have locomotion settings that allow you to teleport around the game world. Generally speaking, games that offer teleportation and narrowed vision settings tend to be easier on you if you’re prone to motion sickness. Even if you’re playing a free-motion game that doesn’t offer teleportation, such as Onward, Echo Arena or Pavlov, you can still use snap-turning. While not as helpful for fending off motion sickness, snap-turning makes turning less jarring for you. Start small. Run around your game of choice with smooth motion turned on. If you’re feeling extra bold, turn on smooth-turning and use the full range of artificial motion granted to you by your controllers. Don’t let yourself get motion sick each time. Instead, do smooth controls for a limited amount of time that you’re able to withstand without getting sick. Once you’re sick, then there’s no going back. But if you train yourself to get used to artificial motion in VR, you’ll increase your tolerance until it’s second nature to be in VR—and you’ll get used to artificial motion like anybody who spends hours in VR each day. You can use the same logic in VR. A mint-flavored candy or stick of chewing gum will help you feel better when you’re feeling motion sick. You can also use mint as a preventative measure when you’re preparing to participate in any activity where you expect to face down a paper bag due to motion sickness. Like mint, ginger root is a world-famous digestive aid that helps with motion sickness as well. You can take it in the form of candy or ginger ale, but make sure that you’re getting real ginger in there. Ginger “flavoring” won’t cut it. You can also find tablets that contain ginger root. This antihistamine is best used for fighting nausea, vomiting, and dizziness. All of which are symptoms of motion sickness that aren’t worth the drama. Here’s a list of side-effects and general precautions to look out for when you’re eyeing up the Dramamine bottles at the local pharmacy. I’ve always dreamed of playing VR games with one of the fancy new omnidirectional treadmills that are trickling into the market. Generally, they don’t come cheap—but if you have the cash (and the patience), they offer the most immersion possible. Be prepared, however, to do more homework than hopping over to a digital shopping cart and clicking “Buy”. Most omnidirectional treadmills are still in the early phase of their consumer rollouts. You might have to send some emails or get involved in a few Kickstarters to get your hands on one of these (as of September 2018). However, the tradeoffs between thumbsticks and a fully realized omnidirectional treadmill should be apparent here. Since an omnidirectional treadmill is activated by your legs and feet, in-game motion won’t feel nearly as artificial as if you were using a thumbstick to move around. Sometimes, your experience in a VR game is determined by the horsepower of the system you’re using to run it. This means that, at least on PC VR, you’ll need to tweak your graphics settings in each game to keep things running smoothly. 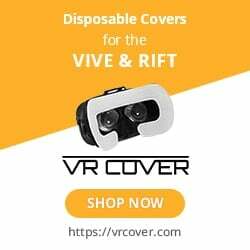 You might think that you can approach VR the same way you’d approach flat screen PC gaming; that is, by immediately turning up your graphics setting to max and letting your beautiful machine do its thing. What if you don’t have a top-of-the-line gaming PC with dual Titan X’s and an Intel 8700K under the hood? Boom! The headset starts jittering and, before you know it, you’re on the floor in a puddle of your own vomit. That’s because overloading your system with graphics settings it can’t handle at 2k (running on multiple displays) will cause your game to run at a framerate below the minimum 60 frames-per-second required for a smooth experience. I might be exaggerating some things here but, when in doubt, turn off Supersampling (SSAA) and mess around with the settings in your game until it stops being jittery. Motion sickness affects almost 80% of people who try VR. Beyond hurting your own experience, there’s no doubt that motion sickness is hurting the accessibility of VR for many other people who hope to join you. That said, it may be useful to pay attention to some of the resources I’ve listed above. Speaking of, the methods you’ve learned in this article are probably only a few that exist out there. There may be better methods that I’ve missed. How do you fight VR-induced motion sickness? Please let us know in the comments.